I may be an engineer, but that doesn't mean I'm not superstitious. Last night I had my final confirmation. This is definitely the year of the Blue Moon. First, back in October, my son Chris turned me on to a brand new beer. Now, I am pretty loyal to my brands of beer. For years it was Guinness Stout in the winter, and New Castle Ale in the summer. Then came Blue Moon, a Belgian-style Wheat Beer. I liked it so much, I made it the offical beer of the Unlikely Boat Builder. Then Helena and I found the perfect boat for us. What was it? A Tom Gilmer-designed Blue Moon. Weird coincidence? Well, the final kicker came last night, which just happened to be New Years Eve. Out of the blue, someone mentioned that this New Years Eve was something special, because it was a Blue Moon -- a month that has two full moons in it. So this is the year that began with a Blue Moon, and for Helena and I, that has to be a good sign. On this Day 18, my goal was to work on Cabin Boy's transom. I had bought a large plank of Mahogany from Condon's. 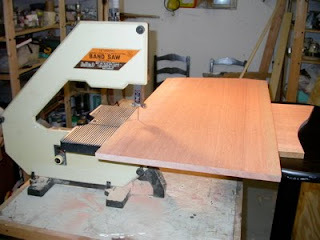 It was a beautiful piece, but since I'd brought it home to my basement workshop, it had developed a nasty crack. The sudden change in humidity combined with a hidden weakness in the board, I suspect. However, I'd been smart enough to buy a longer length than I needed, so I was able to cut the transom out of the good section. But first, I needed to loft the inside transom face onto the board. I'd been planning to pick up a pattern for the transom from my main lofting board, but my lofting skills have taken a big tick upwards since I did my original lofting. I thought it would be more accurate, and probably quicker, to just re-loft the transom right onto the board. Both edges of the board have some sap wood that I wanted to avoid, so I first clamped a long ruler over the sap wood on one edge of the board. This would be my baseline. I was then able to use a square -- from my navigation box -- to erect verticals and do all the other measurements. This is what I should have done the first time I lofted. Having a straight baseline fixed to the lofting board -- something solid enough to use a square on -- heaven, compared to what I'd done before. Sometimes, you should just do what the Boat Building Gods say! The finished transom will have a handsome, rounded 'crown' on top, but to for reasons that will be made clear in a moment, I left the top of the transom uncut. Once I had it cut out, I had to face the problem I mentioned yesterday: how to literally suspend the transom in mid-air, in the right position, at the right angle. I was smart enough to ask for reader ideas in yesterday's post, and I got a bunch of good ones. But the one that seemed the most promising came from Bob Archibald, who just happens to be Blue Moon's previous owner. It was a variation of the micro-invention I'd used to hold up the stem. 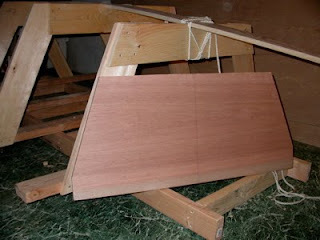 In a nutshell, the idea is to attach two posts to the inside side of the transom, and then use two clothespin clamps to hold the transom in the right position. The beauty of this system is that it's adjustable in 3 dimensions, so I can play around with the transom, and then clamp it when it's just right. I don't need to tell the experts in my audience that this is not the correct way to do this. 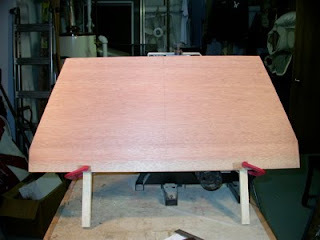 A better way -- particularly if you were going to build more than one copy of the boat -- is to build a special jig that will hold the transom in the right position at the right angle. But I was pretty sure that that would take me several days to get right. The clamping system is a quick fix that is good enough (I hope!) for now. First, I ripped a couple of 1" thick 'legs' out of a piece of scrap wood (I'm starting to get quite a collection of scrap wood!) I simply clamped these legs onto the top of the transom, which is still uncut. Notice the sapwood on the bottom of the board. I could have just clamped right to this wood, which will eventually be cut off, but I used a hardwood spacer under the clamp to protect the wood, anyway. Call me Mr. Neat. So, those two 'legs' are like the stem. 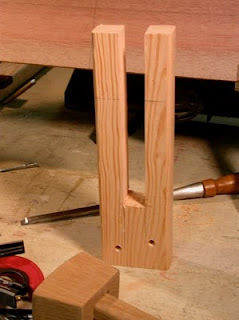 The idea is to bolt two clothespin clamps to the ladder frame, and then clamp the two legs in the clothespins. 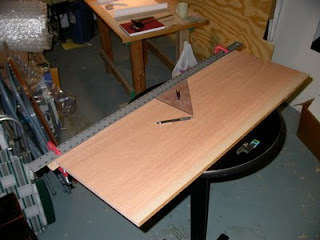 Assuming the clamps are positioned so the centerline on the transom is over the centerline on the frame, I should then be able to position the transom in just the right place, at just the right angle, and then clamp it tight. For fun, I built the clothespins out of a scrap of 2x4, to see if that would work. They are a bit over-built, but they do seem to work just as well as the assembled version from yesterday. And that was a good day's work, I thought, for Day 18. Tomorrow, I'll finish attaching the transom to the ladder-back frame, and tie the whole backbone together. By the way, I expect to be posting to my blog every day until Cabin Boy is done. The time of the day will vary considerable from one day to the next, so if you'd like to be notified when the post is ready, just sign up by clicking on this link. Man, I'm beat. 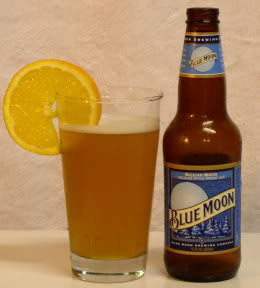 Time for a Blue Moon! Hi! Enjoying reading your blog - especially the little discoveries you are making along the way. The pictures of Cabin Boy with all her sails up are beautiful! I see you have a copy of Kathy Bray's print of "Indian Summer" on your blog. This is my partner, Markus Pye's Blue Moon - who has had an adventurous last five years, including narrowly avoiding being lost to the Brisbane River flood in January 2011. 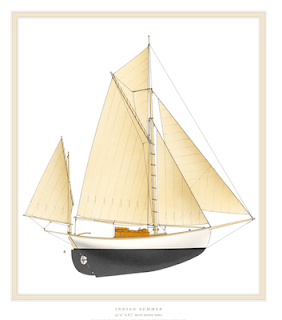 Soon we are hoping she will be ready to relaunch - and out on our beautiful Moreton Bay sailing in all her glory. Gillmer certainly designed a classic beauty in the Blue Moon.